RIM has several programs aimed at getting employees to leave their cars at home more often. This Bixi bike share has a different focus; how to get employees from building to building quickly and efficiently. They are 1 year into a pilot with Bixi supplying bicycles to several of their sites in the Phillip and Albert St. area of Waterloo. The RIM bike share is unique among bike shares. It’s a kind of hybrid between corporate bike shares where bikes can be taken free around a corporate campus and a city bike share where bikes can be rented and driven anywhere. 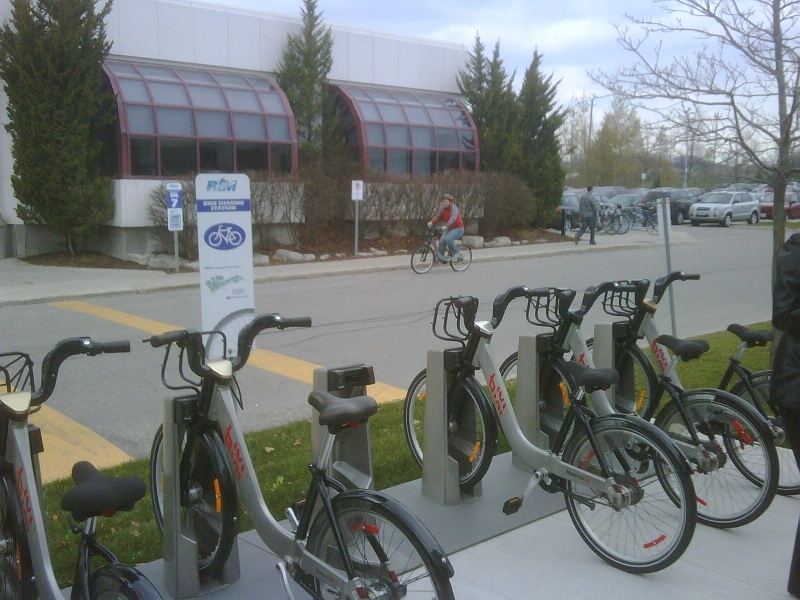 RIM’s bike share is open only to employees of the company and there is no cost for them to participate. But employees can only ride the bikes between RIM buildings that are equipped to handle them. 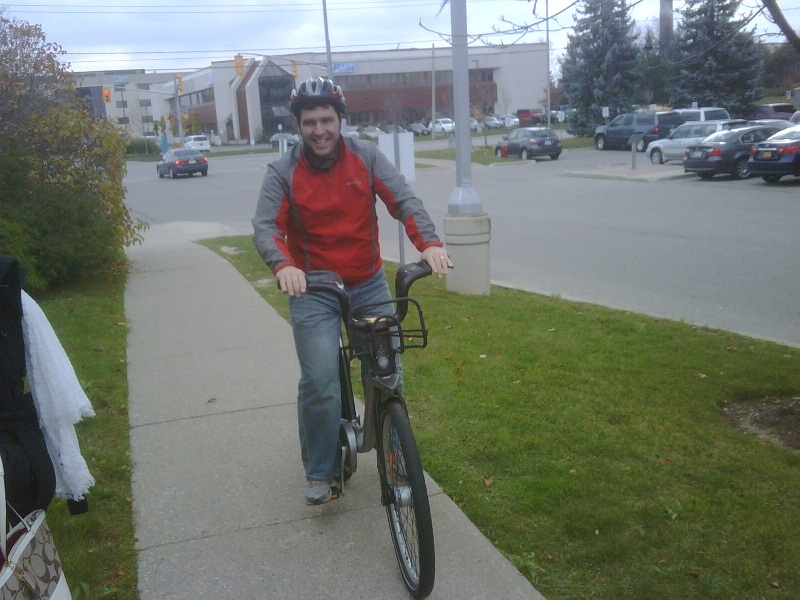 This involves driving the bicycles on public roads as RIM does not have a designated campus setup in Waterloo. Going first means no known pattern for success exists. RIM occupies most of Phillip St. in Waterloo. They have a large building on Hagey Blvd. and some buildings further afield on Kumpf Drive and University Ave. Of these locations, RIM opted to cover only the central locations along Phillip St. I hear that next year they will expand the program to include Hagey Blvd, but no plans are made to include the other outlying buildings. As you would expect, Health and Safety played a big role in planning and implementation. Liability is a major concern when taking on a program like this, especially when the roads are public and you’re the first. So there are strict rules that employees must comply with to participate. Employees complete a 90 minute training session including practice on the bike, signals and rules of the road. An evaluation of rider aptitude follows the training. Employees received the bike share well and uptake was within a cat’s whisker of the program goals. My observation is that there are two features of the program which probably limit uptake. There is a certain amount of forethought required before a bike can be ridden. With mandatory training and helmet requirement, some of the convenience that the system offers is diminished. This is one of those no-way-out scenarios though. The company must provide due diligence in health and safety. With a more open system, I think it could really take off if employees could drive their bikes to the local coffee shop, or down to the plaza’s at Phillip and University for lunch. RIM’s not likely to install Bixi stations all over town though. This will require a wider adoption of Bixi through town and a sharing agreement. Because we biked to the presentation and had our helmets, Graham and I were able to try out the bikes. They look like tanks, but they’re really not that heavy. I was shocked when I picked it up. It was a little awkward to handle, but not more than your first time on any new bike. It’s really exciting to see the initiative that RIM is taking with this bike share. I hope that the legs of this program continue to grow and maybe even spark some interest from city or regional government in sharing a wider initiative. Us regular bike commuters should also remember that the system need not be designed with us in mind. We usually bring our own bikes and don’t need a rental. I think it’s great for RIM to have something like this. I am not aware of any other company in Canada that offers this. As far as I know only Google (in the States) has something in the way of offering bikes. Of course I completely disagree with the strict rules in place, thought don’t actually fault RIM for this. The mandatory helmet rule I obviously dislike. I do understand why RIM wants this, but still disagree. I would be more then willing to sign off to not wear one. Rule 2 & 3, again disagree with but understand why RIM wants them in place. They want to make sure people obey the law while on the road, purely because it will have a reflection on RIM. Most employers tell their employees that while driving in a company vehicle to obey the law right down to the very last thing. Although I do believe RIM can and should ease up on their 3-rules, it is still a start at least in getting a bike share into the business community. Actually, there was talk of Husky Injection Mouldings in Bolton having a bike share system that is on-campus only. I guess they have a number of buildings, but it’s all closed off from public roads. My understanding is that it’s not possible for a person to waive the company of workers compensation responsibility. Even if such a document was drawn up, it would be deemed illegal should it be challenged. So there can be no accommodation by law if you want to go without a helmet. They’re in a bit of a bind there. Interesting. Certainly north end of Waterloo has changed a great deal since I grew up there and went to U. of W. ..several decades ago. Well, it’ll be interesting to see what happens with the pilot. We do have use of bikes for an employer I am with but it is restricted to cycling on the property area where the employees’ buildings are located. It’s not bike share, they’re just bikes with a lock I think. For our water treatment and water testing plants/offices…I work for a large municipality in Alberta. Such facilities tend to be on the edge of town with acreage of land. Are you aware whether BIXI has expanded elsewhere in Kitchener/Waterloo? I’ll be visiting soon and would love to hop off the train onto a bike, en route to meetings. No expansion of the bike share in the region. In general you are entering Car Country Canada. Plan on a getting a rental car to get about with.